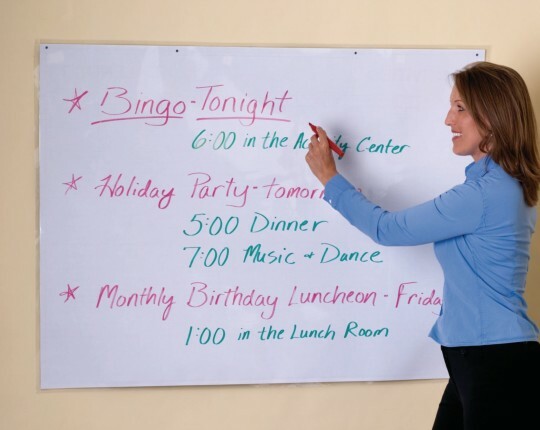 Reusable and economical wipe-clean surface is perfect for announcing important information and activities. Post daily notes or events and simply wipe clean for tomorrow. Grommets make it easy to hang anywhere. Rolls up for easy storage. For use with water-based pens or markers (sold separately). 37" x 49". The perfect large size to communicate important events or happenings with our residents and staff. We also use it as a big Happy Birthday board for everyone to sign on someones special day - creates big smiles! Not worth the money. Could have made it myself. I love to use this product I use It to help my son with school work he Is ADHD and he loves It as well he smiles whenever we use It.